Évora ([ˈɛvuɾɐ]) is a city and a municipality in Portugal. The population in 2011 was 56,596, in an area of 1307.08 km². It is the seat of the Évora District and capital of the Alentejo region. The present Mayor is Carlos Pinto de Sá of the CDU coalition. The municipal holiday is 29 June. Due to its well-preserved old town centre, still partially enclosed by medieval walls, and a large number of monuments dating from various historical periods, including a Roman Temple, Évora is a UNESCO World Heritage Site. It is also a member of the Most Ancient European Towns Network. Évora is ranked number two in the Portuguese most livable cities survey of living conditions published yearly by Expresso. It was ranked first in a study concerning competitiveness of the 18 Portuguese district capitals, according to a 2006 study made by Minho University economic researchers. Évora has a history dating back more than five millennia. It was known as Ebora by the Celtici, a tribal confederacy, south of the Lusitanians (and of Tagus river), who made the town their regional capital. The etymological origin of the name Ebora is from the ancient Celtic word ebora/ebura, plural genitive of the word eburos (yew), name of a species of tree, so its name means "of the yew trees." The city of York, in northern England, at the time of the Roman Empire, was called Eboracum/Eburacum, named after the ancient Celtic place name *Eborakon (Place of Yew Trees), so the old name of York is etymologically related to the city of Évora. Other two hypothesis of the origin of the name Évora is that the Romans had extensive gold mining in Portugal, and the name may be derived from that oro, aurum, (gold) and also may be named after ivory workers, but these two hypotheses are much less likely than the first one, because the name Évora has no relation with gold or with ivory in ancient Celtic, Latin or Portuguese languages or other languages, there is no etymological ground for these two hypotheses. It may have been capital of the kingdom of Astolpas. The Romans conquered the town in 57 BC and expanded it into a walled town. Vestiges from this period (city walls and ruins of Roman baths) still remain. Julius Caesar called it Liberalitas Julia (Julian generosity). The city grew in importance because it lay at the junction of several important routes. During his travels through Gaul and Lusitania, Pliny the Elder also visited this town and mentioned it in his book Naturalis Historia as Ebora Cerealis, because of its many surrounding wheat fields. In those days, Évora became a flourishing city. Its high rank among municipalities in Roman Hispania is clearly shown by many inscriptions and coins. The monumental Corinthian temple in the centre of the town dates from the first century and was probably erected in honour of emperor Augustus. In the fourth century, the town had already a bishop, named Quintianus. During the barbarian invasions, Évora came under the rule of the Visigothic king Leovigild in 584. The town was later raised to the status of a cathedral city. Nevertheless, this was a time of decline and very few artifacts from this period remain. In 715, the city was conquered by the Moors under Tariq ibn-Ziyad who called it Yaburah يابرة. During the Moorish rule (715–1165), the town, part of the Taifa of Badajoz, slowly began to prosper again and developed into an agricultural center with a fortress and a mosque. The present character of the city is evidence of the Moorish influence. During that time, several notables hailed from Evora, including Abd al-Majid ibn Abdun Al-Yaburi عبد المجيد بن عبدون اليابري, a poet whose diwan still survives to this day. Évora was wrested from the Moors through a surprise attack by Gerald the Fearless (Geraldo Sem Pavor) in September 1165. The town came under the rule of the Portuguese king Afonso I in 1166. It then flourished as one of the most dynamic cities in the Kingdom of Portugal during the Middle Ages, especially in the 15th century. The court of the first and second dynasties resided here for long periods, constructing palaces, monuments and religious buildings. Évora became the scene for many royal weddings and a site where many important decisions were made. Particularly thriving during the Avis Dynasty (1385–1580), especially under the reign of Manuel I and John III, Évora became a major centre for the humanities (André de Resende - buried in the cathedral) and artists, such as the sculptor Nicolau Chanterene; the painters Cristóvão de Figueiredo and Gregório Lopes; the composers Manuel Cardoso and Duarte Lobo; the chronicler Duarte Galvão; and the father of Portuguese drama, Gil Vicente. Évora also held a large part of the slave population of Portugal. Nicolas Clenard, a Flemish tutor at the Portuguese court, exclaimed in 1535 that "In Évora, it was as if I had been carried off to a city in hell: everywhere I only meet blacks." The city became the seat of an archbishopric in 1540. The university was founded by the Jesuits in 1559, and it was here that great European Masters such as the Flemish humanists Nicolaus Clenardus (Nicolaas Cleynaerts) (1493–1542), Johannes Vasaeus (Jan Was) (1511–1561) and the theologian Luis de Molina passed on their knowledge. In the 18th century, the Jesuits, who had spread intellectual and religious enlightenment since the 16th century, were expelled from Portugal, the university was closed in 1759 by the Marquis of Pombal, and Évora went into decline. The university was only reopened in 1973. The Battle of Évora was fought on 29 July 1808 during the Peninsular War. An outnumbered Portuguese-Spanish force of 2,500, assisted by poorly armed peasant militiamen, tried to stop a French-Spanish division commanded by Louis Henri Loison but it was routed. Led by the hated Loison, known as Maneta or One-Hand, the French went on to storm the town which was defended by soldiers, militiamen and armed townsmen. Breaking into the town, the attackers slaughtered combatants and non-combatants alike before thoroughly pillaging the place. The French inflicted as many as 8,000 casualties while suffering only 290 of their own. In 1834, Évora was the site of the surrender of the forces of King Miguel I, which marked the end of the Liberal Wars. The many monuments erected by major artists of each period now testify to Évora's lively cultural and rich artistic and historical heritage. The variety of architectural styles (Romanesque, Gothic, Manueline, Renaissance, Baroque), the palaces and the picturesque labyrinth of squares and narrow streets of the city centre are all part of the rich heritage of this museum-city. Évora (altitude 300 m) is situated in Alentejo, a large region of wide plains on the south of Portugal, bordered on the North by the Tagus River and on the South by the region of Algarve. The city is 140 km (87 mi) from the capital city Lisbon, and 80 km (50 mi) from Badajoz at the Spanish border. It is the chief city of the region. The seat of the municipality is the city of Évora, composed by the civil parishes of Évora (São Mamede, Sé, São Pedro e Santo Antão) in the historical centre and the urban parishes of Bacelo e Senhora da Saúde and Malagueira e Horta das Figueiras outside the ancient city walls where most of the population in fact reside. The remaining civil parishes in the municipality are rural or suburban and do not form part of the city for statistic purposes. The city's historical centre has about 4,000 buildings and an area of 1.05 km2 (0.41 sq mi). Évora has a hot-summer mediterranean climate. As typical of the interior Alentejo, Évora is prone to severe heat extremes with an all-time record of 46 °C (115 °F). However, the average summer high usually is around 30 °C (86 °F), which is significantly less severe heat than being found in nearby Andalusia, Spain. This is due to low-scale maritime effects due to the relative proximity to the Atlantic Ocean, which also causes seasonal lag predominantly during the warmer period, with night-time temperatures being milder in September than June as well as in October compared with May. Frosts in winter are frequent but not usually severe, snow falling only twice a decade. Day-time temperatures throughout winter most often staying below 10 °C (50 °F). Angra do Heroísmo, Portugal, since 1986. Mozambique Island, Mozambique, since 1997. 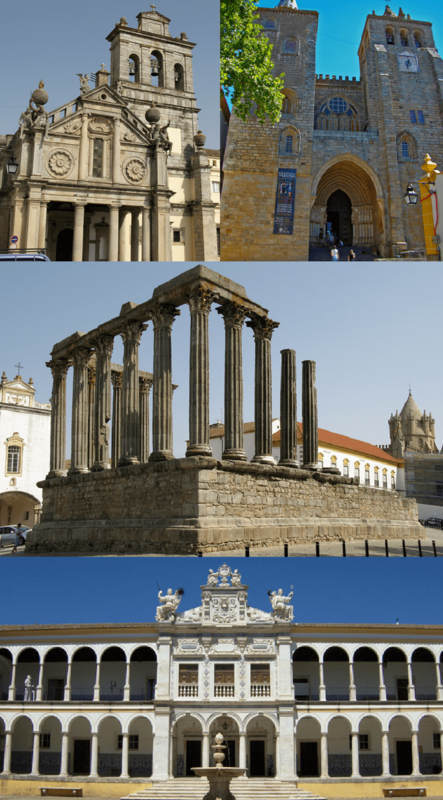 Évora is also part of the Most Ancient European Towns Network. 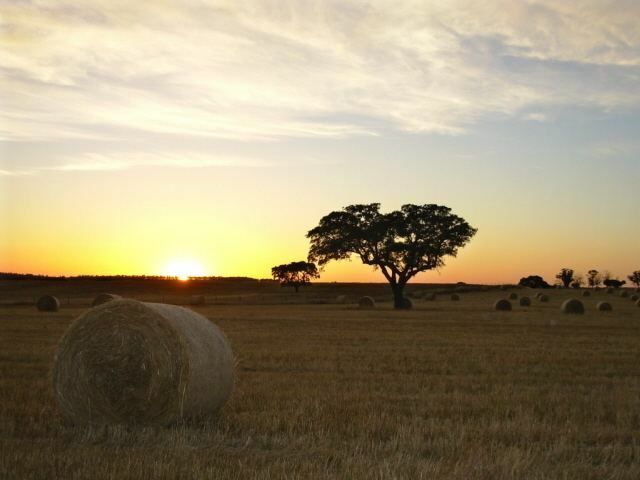 Évora is the chief city of the Alentejo region, and plays a role as an important agricultural and services center. It is home to several institutions with great importance for the region, like the state-run University of Évora and district hospital. Évora has tried to develop the aerospace sector, and has been chosen to host the Portuguese Aeronautical Cluster after Brazilian aircraft manufacturer giant Embraer decided to establish in the city two factories (one of metallic structures and other of composite structures) for the production of aircraft parts along with its European Engineering Center. The city's aeronautical park, which includes an aerodrome, is about to receive a number of other investments related to the aeronautical industry, amongst which the most noteworthy investments are the ones of Lauak and Mecachrome. Évora, as well as the surrounding area, has many hotels, bed-and-breakfasts and various styles of accommodation. Évora can be reached by bus or train, with the construction of a high speed train link to Lisbon and Madrid is planned. There is a small airfield, the Évora Municipal Airport, currently without commercial airline service. The closest major airports are: Beja, Lisbon, Faro and Badajoz. Anta Grande do Zambujeiro, about 10 km (6 mi) from Évora near Valverde: It is the larger dolmen in the region. 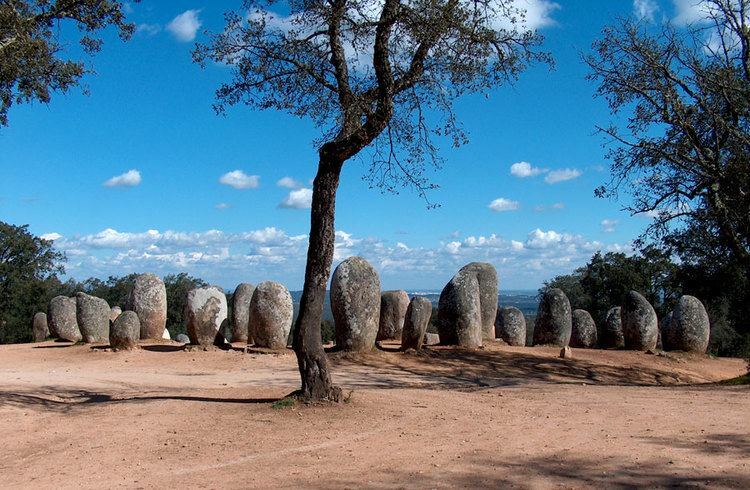 Cromeleque dos Almendres, 15 km (9 mi) from Évora: Megalithic monument, a cromlech with archaeoastronomical interest. The city of Évora is marked by the historic square in the Praça do Geraldo, where King Duarte constructed the Estaus Palace. The square is marked by the Henriquina fountain, dating to 1570, that includes eight jets symbolizing the eight streets that lead to the square. At the northern end of the square is the Church of Saint Andrew (Portuguese: Igreja de Santo Antão) built by Manuel Pires, in the 16th century. A rather large church three-nave church, includes a valuable altar antependium from the 13th century in bas relief. In 1483, Fernando II, the Duke of Braganza was executed in the square, in the presence of his brother-in-law king John II. This square also witnessed thousands of autos-da-fé during the Inquisition; there were 22000 condemnations, during the course of 200 years. Fountain of Portas de Moura (Portuguese: Chafariz das Portas de Moura/Fonte da Porta de Moura), the Renaissance fountain (located in the Largo das Portas de Moura) was built in 1556, and an original design that includes globe surrounded by water (referencing the Age of Discovery). Holy Spirit College of the Order of Christ (Portuguese: Colégio do Espírito Santo/Colégio da Companhia de Jesus/Universidade de Évora), today a nucleus of the University of Évora, the former Jesuit college was ordered constructed by Cardinal-King Henrique in 1559, and includes 16th century Mannerist elements, in addition to academic buildings constructed between the 17th-18th century (including cloister). Royal Palace of Évora: Remnants of a palace built by King Manuel I in Gothic-Renaissance style. According to some chroniclers, it was in this palace, in 1497, that Vasco da Gama was given the command of the squadron he would lead on his maritime journey to India. Palace of the Counts of Basto (Portuguese: Palácio dos Condes de Basto / Paço de São Miguel da Freiria / Palácio do Pátio de São Miguel), a primitive Moorish castle and later residence of the Afonsine dynastic kings. Its outer architecture displays features of Gothic, Manueline, Mudéjar and Renaissance styles. Palace of the Dukes of Cadaval (Portuguese: Paço dos Duques de Cadaval/Palácio dos Duques de Cadaval), a 17th-century palace, built from the remains of an old castle (burnt down in 1384), and later serving as Governors and Royal residances. The palace includes Manueline-Moorish architectural elements (including the Tower of the Five Shields), and whose first-floor houses a collection of manuscripts, family portraits and religious art from the 16th century. Prata Aqueduct (Portuguese: Aqueduto da Prata/Cano da Água da Prata), designed by military architect Francisco de Arruda (who previously designed the Belém Tower, it was built during the reign of by King João III between 1531 and 1537, the huge arches which stretched 9 kilometres (6 miles) to supply water from the interior to Évora. Originally, the aqueduct ended in the Praça do Giraldo, and bisected the city, resulting in the construction of houses, shops and cafés built between the arches (such as in the areas of Rua da Cano, Travessa das Nunes and Rua do Salvador street). A segment of the Roman wall and foundations of period buildings are preserved along Travessa Alcárcova de Cima, a narrow lane in the historic center. This structure was mentioned in the epic poem Os Lusíadas by Luís de Camões. 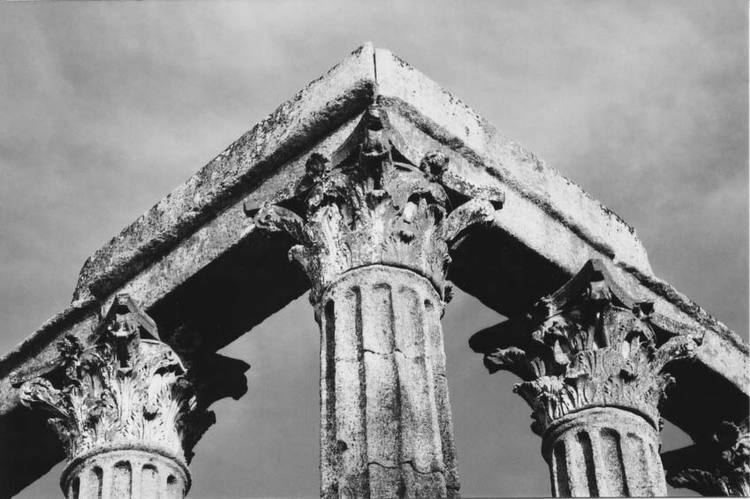 Roman Temple of Évora (Portuguese: Templo romano de Évora), improperly referred to as the Temple of Diana, was a 1st-century (in some references 2nd or 3rd century) temple, dedicated to the cult of Emperor Augustus, that was incorporated into mediaeval building and, thus, survived destruction. Évora's most famous landmark, it is constructed of 7.68 m (25.20 ft) Corinthian columns and fourteen granite columns, and whose base, capitals and the architraves of marble excavated from Estremoz. Cathedral of Évora (Portuguese: Catedral de Évora): Mainly built between 1280 and 1340, it is one of the most important gothic monuments of Portugal. The cathedral has a notable main portal with statues of the Apostles (around 1335) and a beautiful nave and cloister. One transept chapel is Manueline and the outstanding main chapel is Baroque. The pipeorgan and choir stalls are renaissance (around 1566). Chapel of São Brás (Portuguese: Capela de São Brás) Built around 1480, it is a good example of Mudéjar-Gothic with cylindrical buttresses. Only open for prayer. Saint Francis Church (Igreja de São Francisco): Built between the end of the 15th and the early 16th centuries in mixed Gothic-Manueline styles. The wide nave is a masterpiece of late Gothic architecture. Contains many chapels decorated in Baroque style, including the Chapel of Bones (Capela dos Ossos), totally covered with human bones.